By the way, I have to apologize. 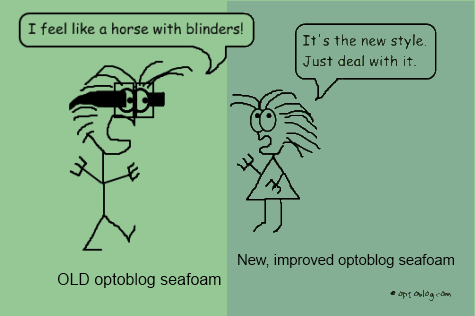 I haven’t been using the official optometry seafoam green color in my Optoblog comics. It has been described at OptViSci. From what I gather, it can be somewhat of a range of color, but I would assume that at least one of the colors on the aaopt.com website are probably the true Optometry Seafoam. The RGB value I have been using on my first 24 comics has been an easy to remember 150,200,150 (Hex# 96C896). I thought it looked good, but now I’ve found something better: 132,175,148 (Hex# 84AF94). I think it looks more seafoamy, and now that I’ve written it down, I know where to look if I forget the numbers. Look for comic #25 and onward to have the corrected color. Which do you think is more seafoam-y?